TJC Launch - RACHEL GALLEY Tri Colour Allegro Sterling Silver Necklace (Size 30), Silver wt 12.30 Gms. RACHEL GALLEY Rhodium Plated Sterling Silver ECLIPSE Necklace (Size 20), Silver wt. 35.25 Gms. Vicenza Collection Sterling Silver Necklace (Size 20), Silver wt. 57.50 Gms. RACHEL GALLEY Rhodium Plated Sterling Silver Necklace (Size 30), Silver wt 19.72 Gms. Thai Sterling Silver Oval Link Necklace (Size 30), Silver wt 39.40 Gms. Royal Bali Collection Sterling Silver Tulang Naga Necklace (Size 18), Silver wt 84.75 Gms. Beauty often lies in the eyes of the beholder, but there are some things that are outright beautiful for every eye. An exquisite piece of jewellery carefully draped around a women’s neck is one such thing. 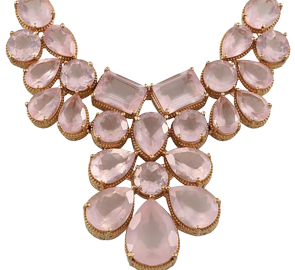 Widely accepted as a representation of the wearer’s personal style, jewellery should always be attractive, modern, classy and evergreen; and, the only style that fits the bill is a statement necklace. Also identified as the most important piece of jewellery this year, these necklaces are a perfect fusion of bold and contemporary design with the elegance and sophistication of gemstones, beads, and precious metals. TJC brings in an impressive assortment of statement necklaces featuring Diamonds, Freshwater and Keshi Pearls, Austrian Crystal, Glass, Beads, and a variety of Quartz, to elevate your both day and night look. Pair the ones with pearls or heavy metal accents with the little black dress or add the chunky, glass and beaded ones to your sweater and instantly achieve the dramatic effect that you desire. As a bold woman, if you are looking forward to creating ripples of admiration through the crowd at a high-profile event or prepping up for an important meeting at work, you need a piece from TJC’s eclectic array of statement necklaces to make an impact. You do not need a reason to surprise your beloved friends or treat yourself, just a pick a fabulous piece from our collection of statement necklaces neatly beaded or deftly casted in sterling silver. Each and every statement necklace from the house of TJC is crafted with utmost care and precision to complement the beauty of not only the women in UK but the whole of Europe. What makes our jewellery truly exceptional is the incredible price-tag it flaunts. Be bold be beautiful with TJC’s jewellery every day!